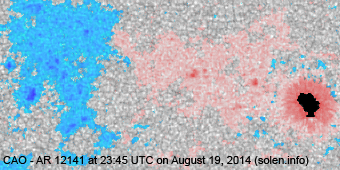 Last major update issued on August 21, 2014 at 04:40 UTC. 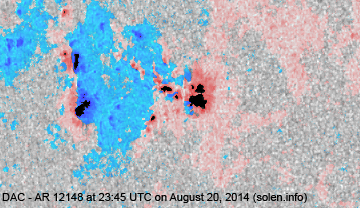 The geomagnetic field was quiet to unsettled on August 20. 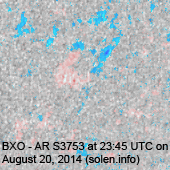 Solar wind speed at SOHO ranged between 285 and 380 km/s under the influence of weak CME effects. 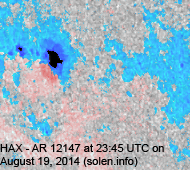 Solar flux at 20h UTC on 2.8 GHz was 118 (increasing 13.9 over the last solar rotation). 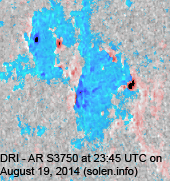 The 90 day 10.7 flux at 1 AU was 130.1. 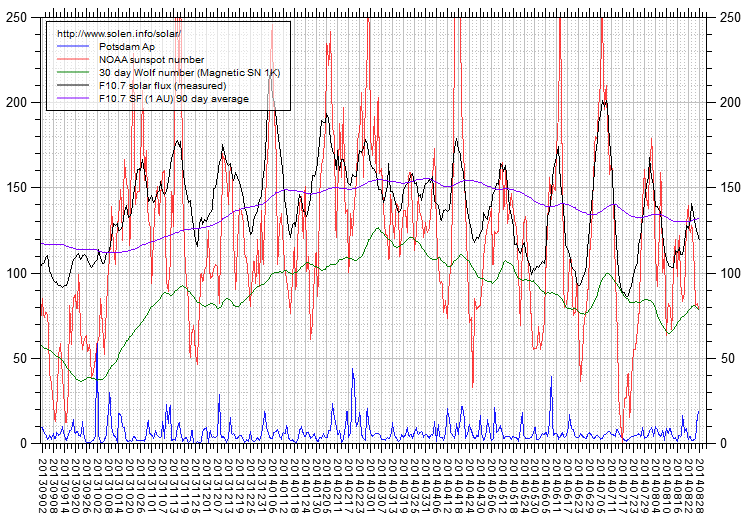 The Potsdam WDC planetary A index was 7 (STAR Ap - based on the mean of three hour interval ap indices: 7.0). 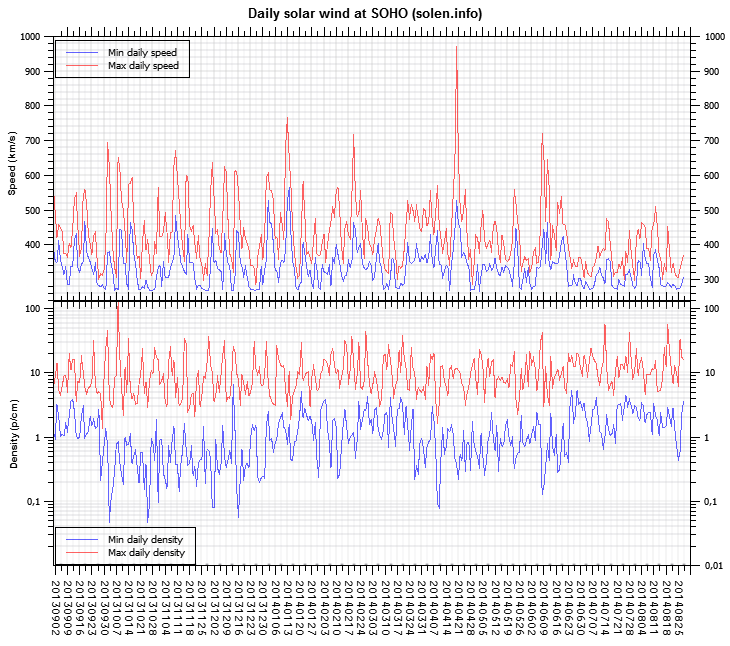 Three hour interval K indices: 31221123 (planetary), 21112222 (Boulder). 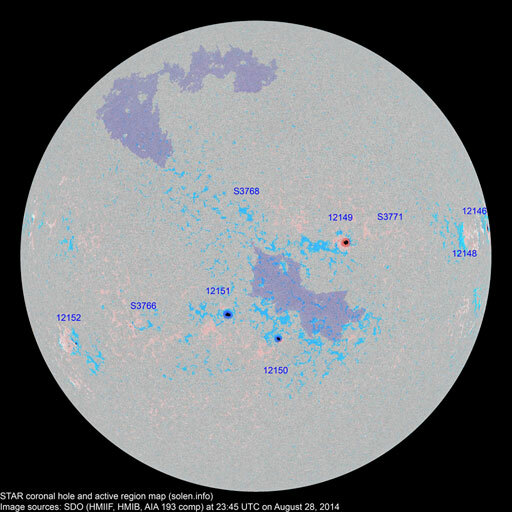 At the time of counting spots (see image time), spots were observed in 8 active regions using 2K resolution (SN: 192) and 6 active regions using 1K resolution (SN: 116) SDO images on the visible solar disk. Region 12139 [N16W47] decayed slowly and was mostly quiet. Region 12141 [N16W22] decayed slowly and quietly. Region 12142 [N08W18] decayed slowly and quietly. 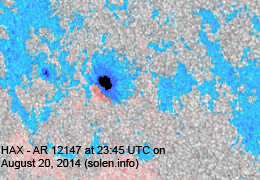 Region 12143 [S04W24] developed slowly and was quiet. Region 12146 [N07E23] developed slowly and has minor polarity intermixing. 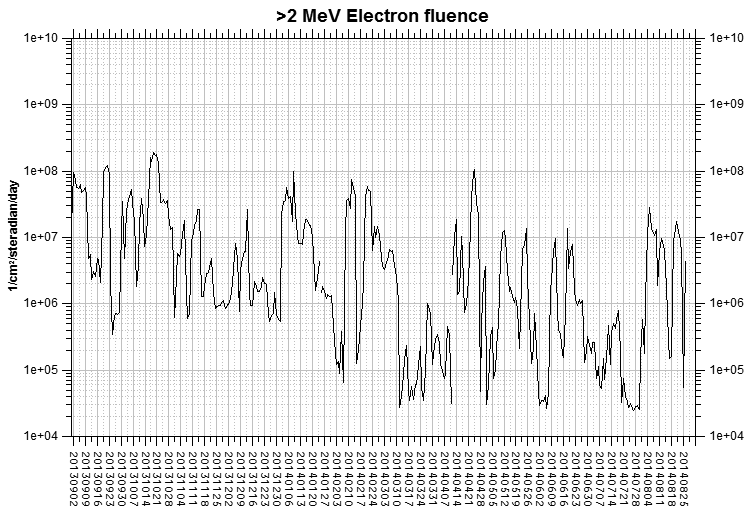 Region 12147 [S09E35] decayed slowly and quietly. 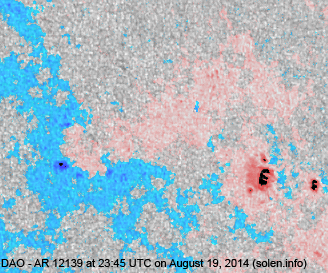 New region 12148 [N07E41] emerged on August 19 and developed further on August 20 when it received its NOAA number. 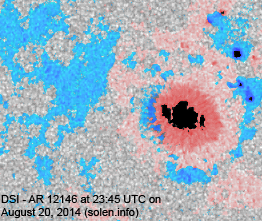 The region has polarity intermixing and could produce C and minor M class flares. New region S3753 [S17W46] emerged with penumbra spots. 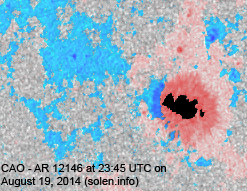 An active region is approaching the northeast limb and produced the most energetic flares of the day. 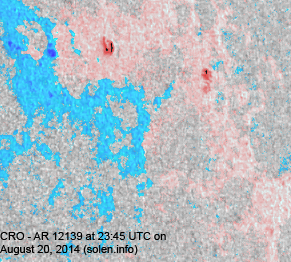 August 18-20: No obviously Earth directed CMEs were observed in LASCO and STEREO imagery. 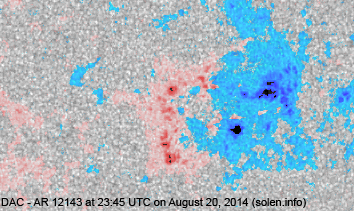 The geomagnetic field is expected to be quiet to unsettled on August 21 due to CME effects and quiet on August 22-23.